I am not really sure how I end up owning this book. All I know is that I had it when I moved to Canada in 2004. So maybe it was a farewell gift from someone, I don’t recall buying it. Aissatou Cisse is a Senegalese born author, an activist and a staunch feminist. She was born with a handicap that does not allow her the usage of her legs. She was appointed special advisor to the President of Senegal on disabled person’s matters in 2012. This is her first novel. She writes and edits children books as well. This woman is such an inspiration. She was born disabled but despite her handicap, she went on to achieve a lot in her life. In fact in one of her interview, she stressed that having a physical disability is not a reason to not contribute to society. The genuine disabled persons are those that have a mental handicap. This is the story of a young woman, Zeyna, who is educated and is working as an administrative assistant in a big company in Dakar, Senegal. Under her family’s pressure, she married an illiterate, traditional,conservative and older man. In fact, her husband is her father’s best friend. The themes addressed in this book are polygamy and it related harms, the clash between modern women and traditional man and the relation between husband and wife in modern times. On the background of the stories, the author also talked about aids and the misconceptions linked to it. I really adore this book. Why? This story is really common in West Africa. Maybe it is common in the rest of Black Africa as well, but I wouldn’t know. I stressed West Africa because Islam plays an important role in this plot. The main character of this novel is from the ethnic group called “Toucouleur” or “Peulh”. The members of this ethnic group love to remind me that “Toucouleur” and “Peulh” are different. But for an outsider like me, I never really understood the difference. So I used the two names interchangeably. Why is this ethnic group important? And why do I even mention it? Well, there are present in all of West Africa and are quite conservative and religious. So when the father of Zeyna Dia, the main character, ordered her to get married to an older man, she had to do it. One might think that this is absurd. 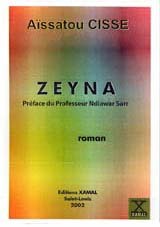 Why would a young woman, like Zeyna, who is educated and modern, do such a thing? I will answer you that our African societies are quite complex these days. No matter how educated or rich you are, it does not make any difference to man. Be it your father, uncle, grandfather or husband. Because under Islamic law, the man is the responsible and mature partner of the couple. He is also the leader of the family. This was also the case in traditional Africa. How do I know it? I read Chinua Achebe’s “Things Fall Apart”. Even Cheikh Anta Diop confirmed it in his “Precolonial Black Africa”. So how exactly do we reconcile traditional society’s rule to modern society’s rule? The answer is we don’t. I have put only four sugars because too much sugar causes an illness called diabetes. Her husband responded: you think you know better because you went to school. You are trying to be smart. You are also cursing me.You want to kill me. This theme is beautifully explored in the book.The clash between the two worlds. The other point worth mentioning is the relationship between women that shared the same husband. The dynamics of such families depend really from place to place. Some people are really happy being part of a big family and living all together. But others ended up being traumatized by the experience. The author skillfully explore this topic by highlighting the hatred of the husband’s daughter. How would you feel if your father married a second wife that has your age or is younger than you? I recommend you this book, it is a great read. The book also gave you great insight on the life in Senegal. Excellent review of what sounds like a very important book. I like how you and the author face the basic contradiction of being a traditional wife and having a career. I think that is a real issue for many women today in many countries and cultures–even here in the mainstream USA though some of us have tried. So glad I found you–are rather you found me.